In 2002, Cuba launched a comprehensive plan to restructure its sugar agroindustry. For several years, sugar industry experts had been discussing the need to downsize the industry, which had expanded significantly in the 1980s. While some reduction in agricultural and industrial capacity was anticipated, the draconian reduction in land devoted to sugarcane (reduction by over 1 million hectares from about 1.8 million hectares) and sugar mills (deactivation of 71 of 156 sugar mills) exceeded expectations. At a press conference in April 2002, then-Minister of the Sugar Industry (MINAZ) General Ulises Rosales del Toro stated that the restructuring plan was intended to maintain a sugar agroindustry capable of producing 4 million tons of sugar per annum, roughly the average annual amount produced in the second half of the 1990s, but with higher efficiency, lower costs, higher profitability, and making a higher contribution to the national economy.1 More than 10 years after the start of the restructuring effort, how has the Cuban sugar agroindustry performed? Have the objectives of restructuring been accomplished? What are the prospects for the Cuban sugar agroindustry in the near future? This paper seeks to provide a progress report on selected aspects of the Cuban sugar agroindustry’s restructuring. It begins by briefly reviewing the industry’s performance in the 1980s and 1990s in order to provide context to the restructuring imperative. It then summarizes the main elements of the restructuring plan, as set out by MINAZ officials. Next, the paper brings together available data on the performance of the industry since restructuring. Finally, the paper closes with some thoughts on the prospects of the sugar agroindustry in the years to come. Boosted by a seemingly inexhaustible sugar demand from the Soviet Union and the socialist countries, purchased at prices that substantially exceeded those of the world market, Cuba expanded its sugar production capacity in the 1980s. At the beginning of the 1980s, Cuba dedicated more than 1.6 million hectares of land to sugarcane cultivation. An additional 250,000 hectares (an increase of 16%) were brought under sugarcane cultivation in the 1980s, so that by the end of the decade, some 1.9 million hectares (or 43% of total land under cultivation in the island) were devoted to sugarcane. Eight mills, the first built in Cuba since the expansionary stage of the sugar industry in the 1920s, with a combined grinding (milling) capacity of 49,800 tons of sugarcane per day (8% increase), were brought on line between 1980 and 1987.3 At the end of the 1980s, Cuba’s sugar production capacity consisted of 156 sugar mills with combined grinding capacity of 647,200 tons of sugarcane per day. Table 1 shows Cuban sugarcane and sugar production in the 1980s and 1990s. In the 1980s, annual sugarcane production ranged between 64 and 74 million tons; with yield rates between 10% and 11%, these volumes of sugarcane translated into sugarcane production averaging 7.35 million tons per annum in the first half of the 1980s and 7.48 million tons per annum in the second half. 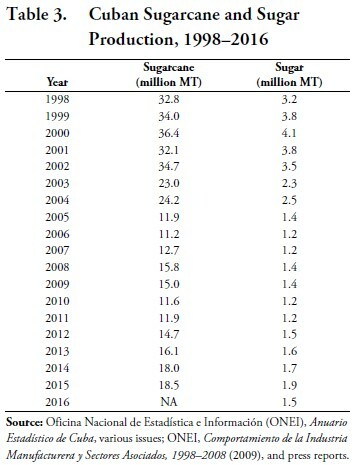 In the early 1990s, sugarcane and sugar production remained strong: sugarcane production reached the very high level of 74.4 million tons in 1990, falling to the still very high level of 71.4 million tons in 1991 and 65.4 million tons in 1992, while sugar production was slightly over 8.0 million tons in 1990, 7.6 million tons in 1991, and 7.0 million tons in 1992. From 1993 onwards, a combination of shortages of critical imported agricultural inputs (e.g., fertilizers, pesticides, spare parts for sugarcane transportation equipment and harvesters) and of oil and spare parts for sugar mills brought about a significant contraction of sugarcane and sugar production. In 1993, sugar production fell by nearly 40% compared to 1992 and continued to fall in the next two years, to just over 3.3 million tons in 1995. 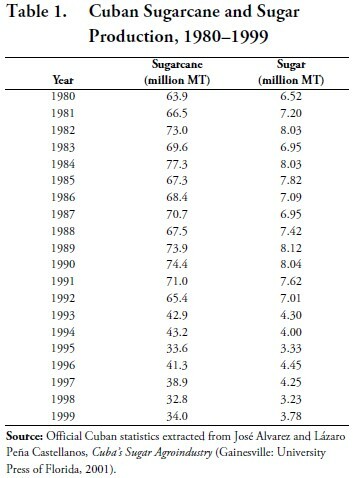 The highest level of production in the second half of the 1990s was 4.45 million tons in 1996, 41% lower than the average of 7.6 million tons reached in 1990–1992 (see Figure 1). The demise of the Cuban sugar industry has its roots in the end of the distortive sugar trading relationship between Cuba and the former Soviet Union. Particularly after Cuba became a member of the Council for Mutual Economic Assistance (CMEA) in 1972 and fully joined the economic community of socialist countries, it was assigned the role of purveyor of sugar to CMEA according to the socialist division of labor. Cuba was guaranteed markets within the socialist bloc for all of the sugar it could produce at preferential prices. Over certain time periods, the price Cuba received from the former Soviet Union for its sugar exports was several-fold higher than the world market price.4 As a result, despite weak prices in the world market that signaled world excess supply of sugar, Cuba increased Cuba’s its sugar production capacity. The break-up of the socialist economic community, followed almost immediately by the dissolution of the Soviet Union, essentially vanished Cuba’s sugar export markets and propelled the island into an economic tailspin. In the 1970s, sugar industry products accounted for 80% of the island’s merchandise exports; this share was about 75% in the 1980s; in the first half of the 1990s it was about 63% and fell to under 40% in the second half of the 1990s. • Sugarcane production would be limited to 700,000 hectares of the most productive and best-suited lands. An additional 127,344 hectares would be used to grow sugarcane to produce molasses. The intention was to achieve sugarcane yields of 54 tons per hectare, compared to actual yields averaging 31.7 tons per hectare in the second half of the 1990s. • The rest of the land formerly devoted to sugarcane (nearly 1.4 million hectares) would be tested to determine its soil characteristics and optimal use; among the uses to which this land would be shifted included cultivation of a variety of crops, livestock, fruit trees or forestry. • Out of the 156 sugar mills, 71 would continue to produce raw sugar, 14 would produce sugar and molasses intended for animal feed, and the remaining 71 would be deactivated (see Figure 2). Out of the units to be deactivated, 5 were to be converted into tourism museums, 5 would remain idle (in reserve), and 61 would be dismantled. • No precise statistics were given on the number of workers who would be affected by the restructuring plan. One estimate by a trade union official was that overall 100,000 workers—split evenly between agricultural and mill workers—would lose their jobs; another source estimated that 60,000 sugarcane workers and 40,000 sugar mill workers would suffer such fate. • Annual sugar production targets would be set at a level that would: (a) satisfy domestic consumption of about 700,000 tons per annum; (b) fulfill export commitments; and (c) allow sales in the world market whenever the world market price was high enough to make it profitable to do so. As mentioned above, then-MINAZ head Rosales del Toro stated that the production target was 4 million tons of sugar per annum, produced with higher efficiency, lower costs, higher profitability, and making a higher contribution to the national economy than in the 1990s. The industry’s restructuring plan was intended to be phased in over three harvests, i.e., by 2005. However, the authorities expedited the implementation by a year, so that it was implemented by 2004. The 71 mills taken out of production tended to be relatively small in terms of grinding capacity and presumably less efficient that the larger ones that remained active. The 71 decommissioned mills accounted for roughly 38% of the pre-restructuring milling capacity. In terms of geographic distribution of the mills that were decommissioned, all provinces were affected to some extent, but the central provinces were hit particularly hard. This is not surprising because these provinces (Matanzas, Villa Clara) were populated by many of the smaller mills. 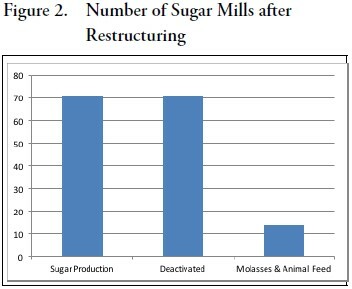 Thus, the province of Matanzas, with 21 mills prior to restructuring, saw only 5 of these mills (29%) continue as sugar producers; in neighboring Villa Clara, which had the largest number of mills prior to the restructuring (28 mills) only 11 (39%) remained operational as sugar producers after restructuring (see Table 2). As a result of restructuring, the locus of the sugar agroindustry moved farther east—after restructuring, Ciego del Avila and Camagüey became the provinces with the largest sugarcane grinding capacity. The impact of the restructuring of the sugar agroindustry was felt throughout the island: the 156 mills that were operational at the end of the 1990s were located in 100 of the 169 municipalities of the nation, demonstrating the broad reach of the industry. As mentioned earlier, statistics on the number of sugar workers dislocated by restructuring are scarce. While the government suggested that 100,000 workers would lose their jobs, Cuba has also reported that in early 2003, 122,000 former sugar agroindustry workers were enrolled in educational programs designed by the Cuban government to relocate dislocated workers from the industry. 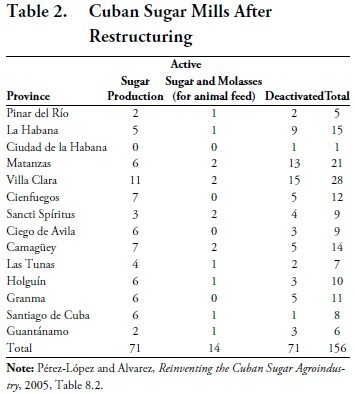 The virtual disappearing act of the Cuban sugar industry since restructuring is evident from data in Table 3. In the five-year period immediately before restructuring (1998–2002), Cuba produced an average of 34.0 million metric tons of sugarcane and 3.7 million tons of sugar per annum. The foreign trade performance of the sugar industry has been equally dismal. While in the second half of the 1980s sugar exports accounted for about three quarters of the value of Cuba’s total exports, in 2014, the most recent year for which official foreign trade data are available, Cuba’s sugar exports accounted for 8.5% of merchandise exports. As the structure of Cuba’s external sector has changed significantly over this period—with exports of services overtaking merchandise exports by a 2:1 ratio—therefore the share of the value of Cuban sugar exports within total exports has shrunk even further. In 2014, this share was in the range of 2–3%, a remarkable change in a country where for generations sugar was the economic mainstay and the saying sin azúcar no hay país was accepted as an article of faith. AZCUBA consists of 25 entities, of which 13 are regional sugar enterprises, 10 are national-level support enterprises, and the rest are research and training institutions. The 13 regional sugar enterprises (Table 4) operate the country’s active sugar mills, as well as agricultural enterprises that supply sugarcane to the mills, and power generation facilities. The regional sugar enterprises also are responsible for business units that are engaged in the process of liquidating assets of the nearly 100 mills that are no longer in operation. The number of industrial units other than sugar mills operated by AZCUBA include: 10 sugar refineries, 12 distilleries, 3 plants that manufacture CO2, 2 glucose manufacturing plants, 2 plants that manufacture glucose, 16 rum factories, 1 plant that produce sorbitol, 2 factories that produce bagasse boards, and 35 animal feed production plants. The installed generating capacity of the sugar industrial complex is about 532 gigawatts. The national-level support enterprises controlled by AZCUBA are given in Table 5. Many of these enterprises service exclusively the domestic industry, but others (e.g., IPROYAZ, AZUTECNIA, TRANZMEC) also provide services abroad. Cuba’s well-known research and training institutions in the sugar agroindustry—such as ATAC (Asociación de Técnicos Azucareros de Cuba, founded in 1927), INICA (Instituto de Investigaciones de la Caña de Azúcar), ICIDCA (Instituto Cubano de los Derivados de la Caña de Azúcar), and CNCA (Centro Nacional de Capacitación Azucarera)—provide credibility to Cuba’s offer of services abroad. 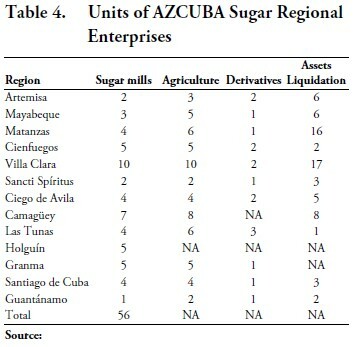 The AZCUBA webpage provides some information on each of the sugar regional enterprises but does not provide a comprehensive list of the active sugar mills. 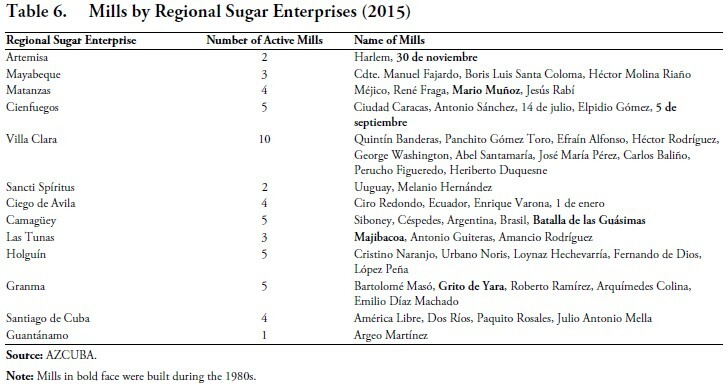 Combining information from this source with information from another AZCUBA source,10 we have compiled (Table 6) a list of 53 sugar mills operational in 2015.11 This means that 18 fewer sugar mills were active in 2015 (a decline of 25%) compared to the 71 mills that had been earmarked to continue as sugar producers pursuant to the 2002 restructuring plan. The performance of the sugar agroindustry has improved since the establishment of AZCUBA. In 2010 and 2011, the two years prior to its establishment, sugar production was about 1.2 million tons; in 2012, the first zafra after the creation of AZCUBA, production rose by 300,000 tons (25%) although still to an anemic 1.5 million tons and rose in the following years to reach as high as 1.9 million tons in 2015. The steady increase in sugar production ended in the most recent (2016) zafra, when production fell to 1.6 million tons, 19% lower than the 1.9 million tons produced in 2015. 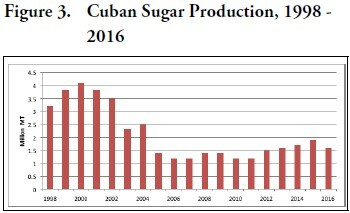 As can be seen in Figure 3, despite the relative improvement since 2012, Cuban sugar production has not reached 2 million tons, half of the 4 million tons per annum foreseen in the sugar industry restructuring plan. A potentially important development was the agreement reached in November 2012 between AZCUBA and the Brazilian company Compañía de Obras en Infraestructura (COI), a subsidiary of giant Brazilian multinational construction company Odebrecht, for the latter to administer the 5 de septiembre sugar mill in Cienfuegos province.12 The agreement, which reportedly will run for 13 years, calls for the Brazilian company to upgrade the mill and bring in new machinery and transport equipment for the harvest. Unquestionably, this arrangement could be helpful to the Cuban industry by providing fresh capital, equipment and Brazilian technology and know-how; however, to make a significant impact on the industry as a whole, it would have to be replicated extensively. Undoubtedly, the 5 de septiembre mill was chosen for this initial foreign management contract because it is one of the “new” mills built in the 1980s and therefore it is not subject to potential claims from former mill owners whose property might have been confiscated by the Cuban government.13 The names of the other five “new” mills that were active in 2015 and share this characteristic of not being subject to claims are bolded in Table 6. Interestingly, two of the “new” mills built in the 1980s (Batalla de Santa Clara and Jesús Suárez Gayol) were not active in 2015. A brochure distributed by the Cuban Ministry of Foreign Trade and Foreign Investment in late 2014 publicizing foreign investment opportunities in the island identifies investments in the sugar sector; it indicates that such investments would be negotiated with the enterprise Zerus S.A. and might include establishing biomass electricity generation units at 19 sugar mills, capable of producing more than 1900 gigawatt-hours per annum, which would be integrated into the national electrical system.14 At this time there is information suggesting that the desired investments in biomass electricity generation have materialized. Sugar world market prices are notoriously volatile, subject to significant fluctuations that can wreak havoc with the economies of countries dependent on exports to the world market. The volatility of world sugar prices was one of the factors that affected Cuba’s development patterns throughout the 20th century. Arguably, by reducing dependence on sugar production and exports, Cuba has obviated some of the disruptive effects of sugar price fluctuations. At the same time, Cuba has missed the opportunity afforded by very high sugar world market prices in some years (e.g., 2010–2012, when world market prices exceed $0.20 per pound) because of limited availability of sugar supplies to export. Table 7 shows Cuban sugar production and average world market price of sugar (in US cents/pound) for the period 1998–2016; Figure 4 plots both series superimposed on the same time axis. Cuban domestic sugar consumption is estimated at 600,000–700,000 tons per year and contractual exports to China (to repay China for commodity exports to the island and credits) at 400,000 tons,15 so that Cuban production needs to exceed 1.0 to 1.1 million tons of sugar in order to have a surplus that can be exported to other markets. Sugar world markets prices have exceeded 10 US cents/pound since 2005, a strong performance for over a decade, with prices exceeding 15 US cents/ pound since 2009 and 20 US cents/pound for 2010– 2012. When sugar world market prices are high, as has been the case during the last decade, the opportunity cost of the dismantling of the sugar industry becomes painfully evident. 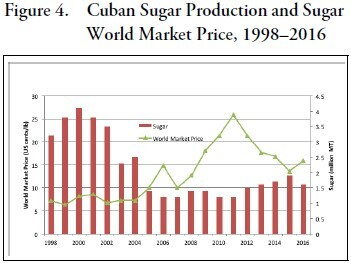 For the period 2006–2016, the trends in world market sugar prices and Cuban sugar production are mirror images of each other, highlighting the opportunity cost Cuba incurred by not being able to export at the high world market prices. In a book I co-edited with José Alvarez published in 2005,16 we argued that while the future of the Cuban sugar production industry was questionable, there were opportunities for the Cuban sugar agroindustry, that is, for the range of economic activities related to the processing of sugarcane. In our edited volume we deliberately used the concept of reinventing the sugar agroindustry (rather than its restructuring) to make it clear that in our view, more than manipulation of production capacities within the structure of the industry would be needed to create a competitive and profitable agroindustry, built on historical foundations, but incorporating systemic structural changes such as private ownership, foreign investment, flexible and independent decision making by production units, truly independent sugarcane cooperatives, reduced state intervention (limited to setting regulatory role, but no management role), and freely operating labor and input markets. • Improvements to sugarcane agriculture, particularly in the form of introducing sugarcane varieties that are optimal for the specific product that is required, whether it might be sugar, biomass, or some other by-product; crop rotation; and development of a sugarcane-based animal feed industry. • Diversification of sugar production, to include products that command a price premium, such as organic sugar. • Holistic approaches based on the proposition that sugarcane is a raw material that can be used to produce a family of products, of which sugar is only one. Rather than being mainly or exclusively producers of sugar, mills would be reconfigured to also produce ethanol and electricity for sale. • Going a step beyond, one of the contributors to the book posits that Cuba could adopt the concept of a biorefinery, a value chain that uses sugarcane as a raw material to obtain sugar, ethanol (liquid fuel, solvent, beverages), solid fuels (foliage, pith, bagasse), gaseous fuels (methane from biodigestion of stillage, fuel gas from bagasse gasification), heat, steam, electricity, bagasse fiber (for papers and boards), sucro-chemicals, and ethanol-derived chemicals. 1. Juan Varela Pérez, “Vamos a moler la caña que económicamente se justifique,” Granma (August 23, 2002). 2. This section of the paper and the following one borrow heavily from Jorge F. Pérez-López and José Alvarez, Reinventing the Cuban Sugar Agroindustry (Lanham, Maryland: Lexington Books, 2005), particularly Chapters 2 and 8. 3. The new mills (and completion year) are: (1) Batalla de las Guásimas, located in Vertientes, Camagüey province, 1980; (2) 30 de noviembre, San Cristóbal, Pinar del Río, 1980; (3) 5 de septiembre, Cartagena, Cienfuegos, 1981; (4) Grito de Yara, Granma, 1982; (5) Jesús Suárez Gayol, Camagüey, 1982; (6) Batalla de Santa Clara, Villa Clara, 1986; (7) Mario Muñoz, Matanzas, 1986; and (8) Majibacoa, Las Tunas, 1987. 4. On the subsidies see, e.g., Jorge Pérez-López, The Economics of Cuban Sugar (Pittsburgh: University of Pittsburgh Press, 1991), particularly Chapter 9. 5. Alvaro Reynoso (1829–1888) was a Cuban scientist whose essay Ensayo sobre el cultivo de la caña de azúcar (1862) has served as a primer for sugarcane growers around the world. 6. 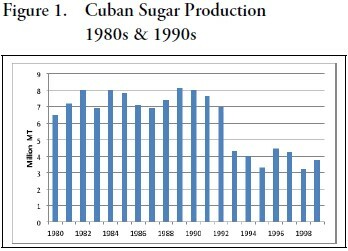 Throughout the twentieth century and until around 2010, sugar sector statistics were probably the most reliable and abundant within Cuban economic statistics. Beginning in 1903, an annual yearbook of the sugar industry was published first under the title Industria Azucarera y sus Derivados (1903–1931) and then by the journal Cuba Económica y Financiera under the title Anuario Azucarero de Cuba (1937–1962). These sources included extensive information on agricultural and industrial activities related to sugar production, including mill-level statistics. After the nationalization of the sugar industry, different statistical publications of the Cuban government continued to provide data on the industry, although not at the level of individual mills. Statistical yearbooks usually include one table with salient sugar industry information, such as sugarcane processed, length of the zafra (in days), sugarcane agricultural yield, industrial yield, polarization level, and so on, and in addition they provide some sugar export statistics. 7. Marc Frank, “Cuba 300,000 tonnes short of raw sugar goal as harvest end,” Reuters (June 9, 2015); “La producción de azúcar en Cuba decreció en un 19% en la zafra 2015–2016,” EFE, El Nuevo Herald (July 5, 2016); “La zafra 2015–2016 redujo en un 19% la producción de azúcar en la isla,” Diario de Cuba (July 6, 2016). 8. Consejo de Estado, Decreto-Ley No. 287, “De la Extinción del Ministerio del Azúcar”; Consejo de Ministros, Decreto No. 294, “Creación de la Organización Superior de Dirección Grupo Azucarero, sus Funciones y las Facultades de su Presidente,” Gaceta Oficial (November 20, 2011). 10. E.g., “Impacto del Sistema Integrado de Gestión de la Productividad en la Cosecha Mecanizada,” http://www.oitsimapro.org/uploads/ 3/1/9/0/31906627/azcuba_chile_2015.pdf. 12. Rosa Tania Valdés and Marc Frank, “Cuba opens sugar sector to foreign management,” Reuters, November 7, 2012. 13. It is possible that there are also property claims on the land where the “new” mills were built and on the agricultural lands that supply the mills, but this is not considered here. 14. Ministerio del Comercio Exterior y de la Inversión Extranjera, Cuba: Cartera de Oportunidades de Inversión Extranjera 2015 (November 2014). 15. “Cuba sees 2013–14 raw sugar output at 1.8 million tonnes,” Reuters (September 29, 2013). 16. Jorge Pérez-López and José Alvarez, Reinventing the Cuban Sugar Agroindustry (Lanham, Maryland: Lexington Books, 2005).